Saracens booked a place in the Champions Cup final by beating Wasps 24-17 at the Madejski Stadium in Reading. Saracens will play the winner of tomorrow’s other Semi-final between Leicester Tigers and Racing 92 in Lyon Saturday May 14. England lock Maro Itoje was at the heart of a committed Saracens forward effort as they saw off their English rivals. 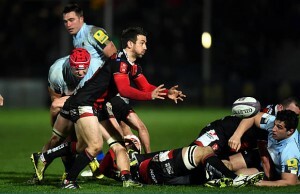 Victory kept Premiership leaders Saracens on course for a domestic and European double. The London club will now play the winners of Sunday’s second semi-final between Leicester and Paris-based Racing 92 in the May 14 European final in Lyon. Saracens dominated up front but could not shake Wasps off as they unusually squandered chances. Saracens, losing European finalists in 2014 and yet to win the continental title, led 8-7 at half-time after a charge-down try by Michael Rhodes and a penalty by Owen Farrell helped them recover after it took Wasps just 73 seconds to open the scoring through Dan Robson’s converted try. Two more penalties by England goal-kicker Farrell and one from Gopperth followed. Farrell kicked another penalty before a Saracens penalty try late on took them into a 24-10 lead. There was still time for Wasps replacement Ashley Johnson to score a converted try but Saracens saw out the game. “When you run yourself into the ground like we did, then there is not much more that you can ask,” said Wasps captain James Haskell. The two sides had met twice in the Premiership this season, with Saracens winning 26-16 in December and Wasps enjoying a 64-23 rout in February — when several of Saracens’ England grand slam-winning stars were on Six Nations duty against Italy. Wasps, the last English side to be crowned champions of Europe in 2007, lived up to their reputation for exciting rugby by catching Saracens cold with a scintillating try just over a minute into the match. 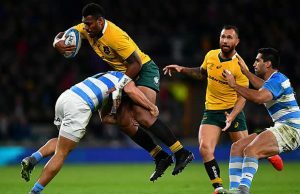 Gopperth and veteran Australia flanker George Smith worked a switch move that released express wing Christian Wade, who scored six tries in a Premiership match against Worcester last weekend. Wade collected the ball on the halfway line and beat two men before his inside pass found scrum-half Robson, who in turn side-stepped his marker and went over. Kiwi fly-half Gopperth, whose conversion with the last kick of the game sealed a dramatic quarter-final win over Exeter, added the extras and Wasps led 7-0. Farrell then surprisingly pulled a 30-metre penalty wide of the posts. Saracens, however were gaining ground through their forwards and their pressure was eventually rewarded when flanker Rhodes charged down Gopperth’s clearance kick for a 28th-minute try. Farrell missed the conversion from out on the right and Wasps still led 7-5. But a Wasps ruck offence on the stroke of half-time saw Farrell succeed with an easy penalty that gave Sarries an 8-7 lead at the break. And when Smith infringed at a ruck early in the second period, Farrell punished Wasps with a successful penalty from just inside the half-way line. Minutes later Farrell landed near 50-metre penalty and Saracens were 14-7 in front. Saracens though were down to 14 men when Farrell was shown a yellow card in the 51st minute for a head-high tackle on Robson that eventually saw the Wasps No 9 taken off the field on a stretcher. Gopperth kicked the resulting penalty and Saracens’ lead had been cut to 14-10. Haskell was involved in some shuddering collisions with England team-mates Billy Vunipola and Itoje up front. Farrell, head bandaged after his clash with Robson, then missed a long-range penalty immediately upon his return from the sin-bin. But he made no mistake from in front of the posts with 12 minutes left when Wasps replacement Simon McIntyre was sin-binned for kicking Itoje in the face. Saracens, starving Wasps of posssion, extended their with a 73rd-minute penalty try awarded after Wasps collapsed a maul that started from outside the 22. Johnson then pounced after a good break by Elliot Daly but it was all too late for Wasps. Itoje was named European Rugby Champions Cup man of the match.